Last year I participated in a blogathon dedicated to Billy Wilder. My choice was “The Lost Weekend”, a dated melodrama that won the Academy Award for Best picture and bestowed upon Mr. Wilder his first two Oscars after five previous nominations. 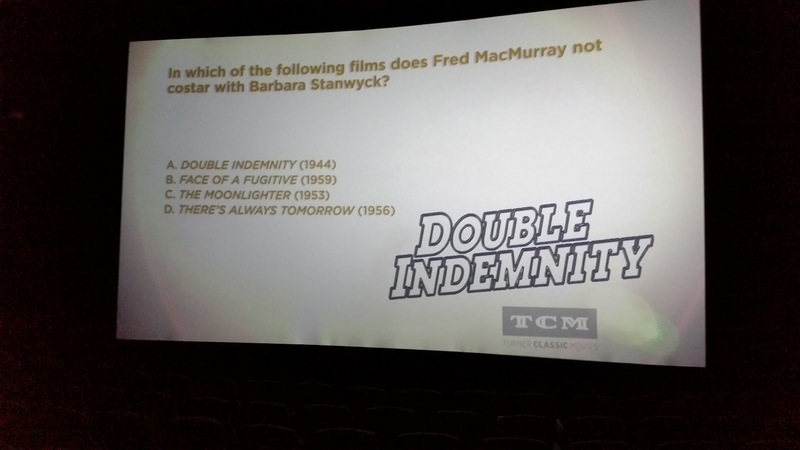 Two of those nominations were for this film which is screening as part of a TCM/Fathom Event promoting the new Blu Ray release of “Double Indemnity”. It was more deserving of the awards than “The Lost Weekend” but then the Academy is notorious for being just behind the curve. This is a terrific film noir, set in Los Angeles and featuring some of the snappiest dialogue you are likely to encounter in a theater. Phyllis: Mr. Neff, why don’t you drop by tomorrow evening about eight-thirty. He’ll be in then. Phyllis: My husband. You were anxious to talk to him weren’t you? Walter Neff: Yeah, I was, but I’m sort of getting over the idea, if you know what I mean. Phyllis: There’s a speed limit in this state, Mr. Neff. Forty-five miles an hour. Phyllis: I’d say around ninety. Phyllis: Suppose I let you off with a warning this time. Walter Neff: Suppose it doesn’t take. Phyllis: Suppose I have to whack you over the knuckles. Walter Neff: Suppose I bust out crying and put my head on your shoulder. Phyllis: Suppose you try putting it on my husband’s shoulder. Walter Neff: That tears it. Barbara Stanwyck is hot in her platinum blonde hair and white sweater. It’s easy to see why Walter Neff fell into her plan so easily. Like all noir vixens, she is duplicitous and irresistible. Even with the Hayes code still in force, the innuendo in this film is pretty smoking. The famous meetings at Jerry’s Market as Neff and Phyllis cruise up and down the aisles of canned vegetables and boxed baby formula are still enticing and fun to watch. If you are from Southern California, it’s also interesting to hear all the local references to neighborhoods and institutions. Both USC and UCLA get a nod in the film. Glendale, Santa Monica and Los Feliz are also named. I got a kick out of seeing Walter stop at a drive-in diner and get served a beer on a tray like he was at Bobs or Twoheys. There is also a musical interlude at the Hollywood Bowl. The story of the step daughter and her boyfriend, some times distracts from the main focus but I recognize they are effective plot devices to allow the story to simmer more as it comes to a hard boil. The femme fatale and the cold hearted sap she falls in with are epitomized by the two leads in this film. Along with “the Postman Always Rings Twice”, these are the essential tropes of a dark film from this period. Wilder’s own “Sunset Boulevard” uses the same flashback plot structure as this movie. We know the fate of the lead character at the start of the film, we just have to have the story told back to us in a way that makes it compelling, and the first person descriptions allow some great observations. Tough talking guys who call their obsessively powerful women “Baby” and hard as flint women who hide some of their emotions behind sunglasses are just what is called for on a hot day in July. Walter Neff: Yes, I killed him. I killed him for money – and a woman – and I didn’t get the money and I didn’t get the woman. Pretty, isn’t it? 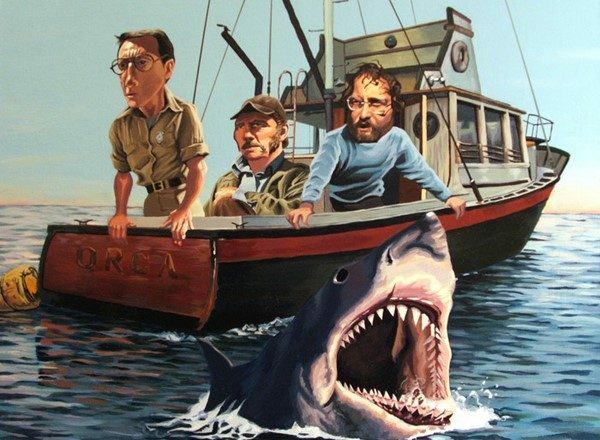 After all the films I saw at the TCM Festival and the Fathom screenings of “Jaws” that I attended last month, these events are feeling more and more like the way I want to see older films. The slide show for the event listed five or six upcoming events that will also be bringing me back to the theater under the umbrella of TCM.